Always the big local run of the summer the Weymouth Run was expanded several years back to an entire week of runs. Sunday's Weymouth run is still the key event and the one with the most riders - not everyone is retired and can attend for the whole week! Several made the trek from overseas though and there were small Dutch and German contingents. The weather for the whole week was pretty much ideal and turnout for each of the runs was good with seemingly few breakdowns. Myself I managed one run and two coffee stops. 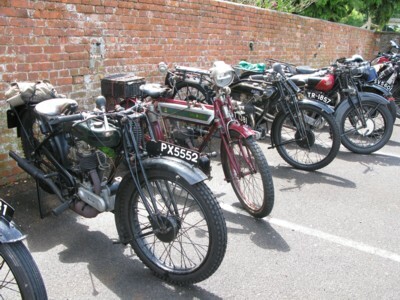 Most of the machines entered were more recent, perhaps reflecting that a run or day for a week is a lot to expect from a vintage bike. 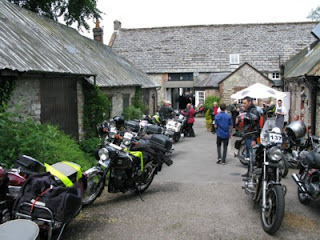 Highlights of the week were seeing Cerne Abbas full of bikes for the lunch stop on Sunday, excellent fish and chips in Swanage and getting in the miles on Dorset country roads in proper English summer weather. 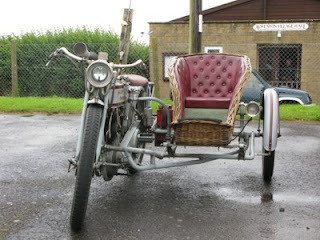 This Ardie came over from Germany. German built but heavily British influenced with its big JAP side-valve engine it is a really high quality machine. 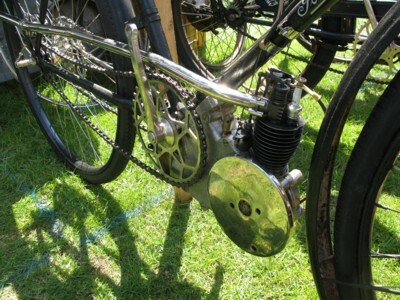 The attention to detail on the build really puts many British bikes of the era to shame with the fine quality even going down to levers, switches and even a very neat map and instrument light! Sunbeam combination fitted with a JAP 750cc sv motor. 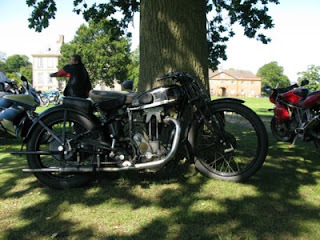 ﻿A really nicely made Sunbeam special. 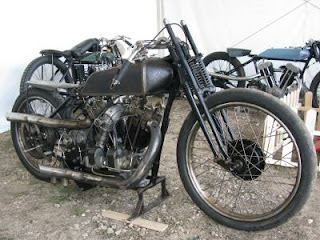 Fitted by the builder with a JAP 750cc side valve twin motor it passed the 'specials test' of looking like something that could have been factory produced. 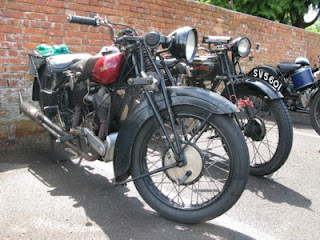 In fact it seems strange that Sunbeam dropped twins from their catalogue in the early vintage era. 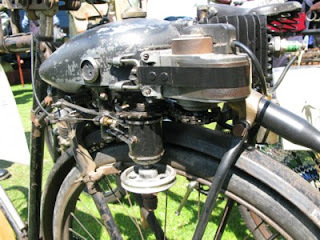 It would have been easy enough to offer one as their 600cc side valve single cycle parts were ideal to accept a twin. James 500cc ohv v twin. Late vintage ohv 500cc James v twin. 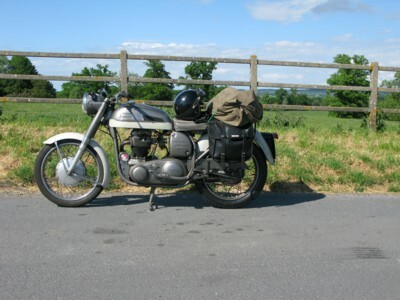 Fitted with James' own engine it is a beautifully high quality machine; light, nimble and designed for solo riding as against the majority of the Brit v twin buses of the era. 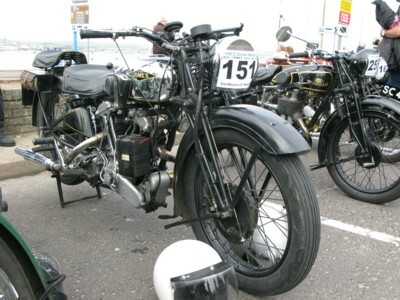 I followed it as it was ridden two-up on Sunday's run, it kept a good pace and sounded superb. A bit of smoke from one pot but we can forgive it that! 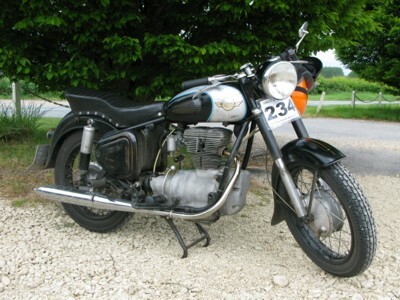 AWO Simson 250cc model 425 single. 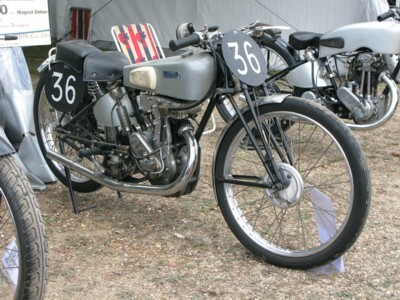 This is the 425 Sport model. The sport denotes swinging arm rather than plunger suspension as on the touring model. 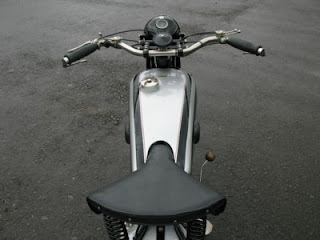 A beautifully turned out Moto Rumi Tipo Sport. A wonderfully eccentric yet functional design - I've always wanted one. Seems hard though to justify the high prices they fetch. Perhaps at six foot three I'm a bit too large a pilot as well as holding different spending priorities. 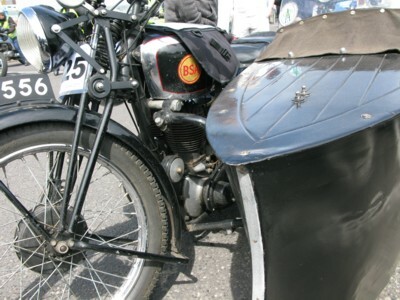 Excellent Matchless G80 single with bathtub sidecar! 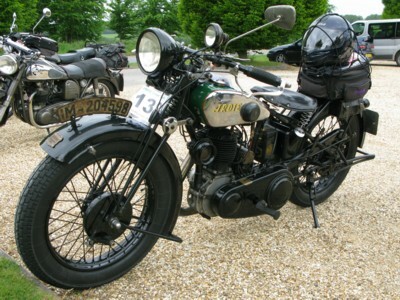 BSA M21 with launch type sidecar. 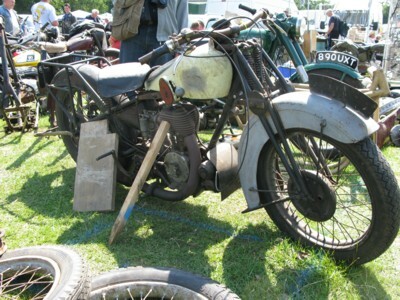 Tidy late thirties BSA M21 fitted as it should be with a sidecar. 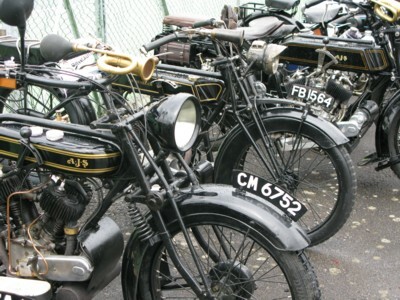 In this case a launch type of the deisgn favoured through the late twenties and thirties. Cycle race 'stayer' in action. 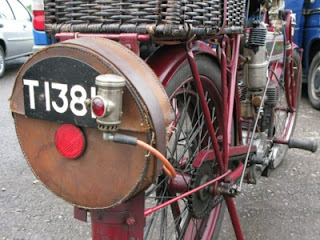 One of the several cycle pacers in the 'stayer' parade. I'd hoped that they might be actually pacing period track bicycles. 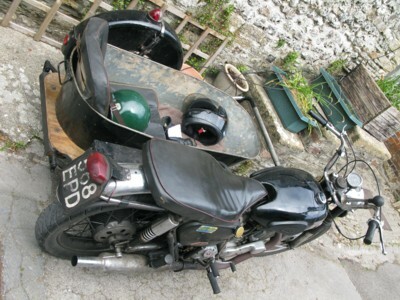 If I'd have had a suitable treader there I might have volunteered though it could well have exposed a fitness deficit. Plus I suspect that there is quite a degree of skill required from both the stayer pilot in keeping a nice steady pace and the cyclist keeping close enough to benefit with making catastrophic contact. Look at the huge wooden belt pulley. 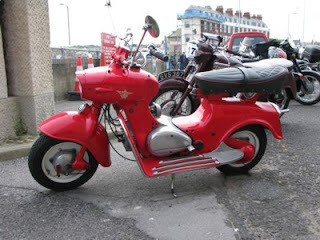 Sima Violet flat twin two stroke racer - loud! Quite possibly the loudest vehicle I have ever come across. 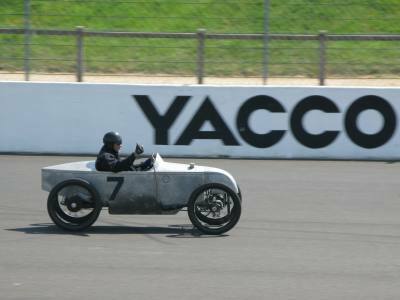 Sima Violet monoposto racer. 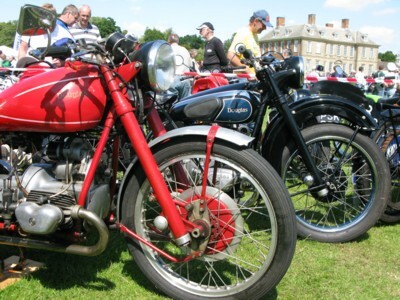 A flat twin 500cc two stroke engine running through short megaphones. 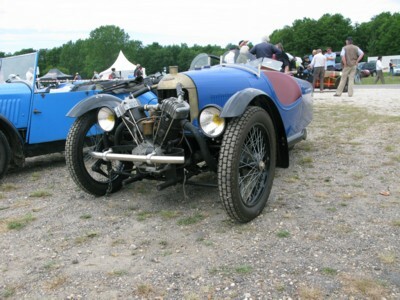 More noise than speed perhaps but it kept a fair pace with later sports Morgans with an engine only half the size. Super Kim Agentinian land speed record contender. 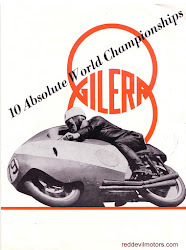 'Super Kim' Argentinian record racer. Built by a producer of motorcycling accessories from the starting point of a Zenith, it sadly never quite broke any land speed records but was beautifully made. 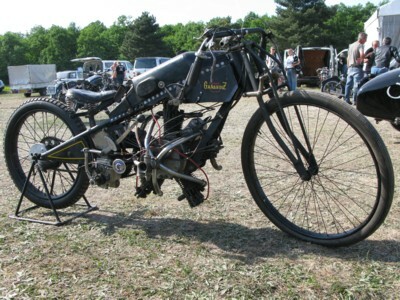 1700cc and supercharged. As a nice touch relatives of the builder were at the event but alas the bike was not fired up. 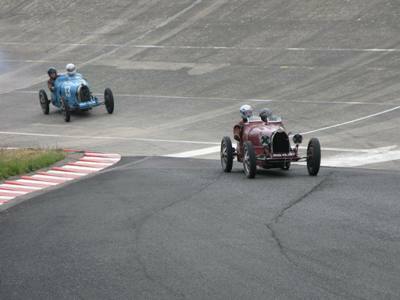 Bugattis hit the accursed chicane. A pair of Bugattis on the dreaded Montlhery chicane; seemingly put in the track to stop folks getting high up on the banking. 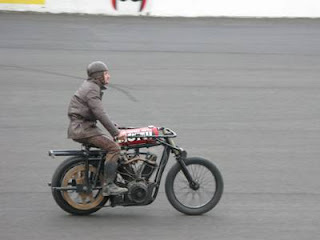 It was one disappointment of the event, given that there were so many authentic speed bowl racing machines present, that entrants weren't able to give full gas and lap on the full banked outer circuit. 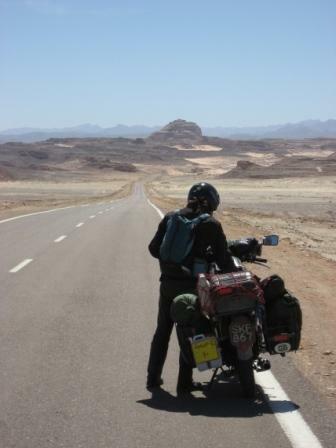 The section of banking used nowadays is relatively small and getting up near the top is a challenge. 'Piglet' GN / Ford special. 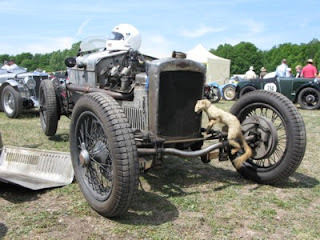 Frazer Nash / GN / Ford special 'piglet' replete with taxidermy weasel gave a good showing of itself around the circuit. 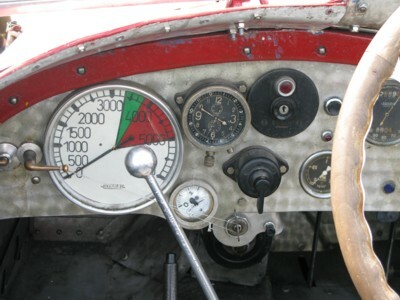 Dashboard view of a Maserati monoposto. 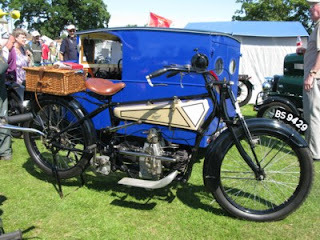 Sandford three wheeler on the grid. French built Sandford three-wheeler on the starting grid. 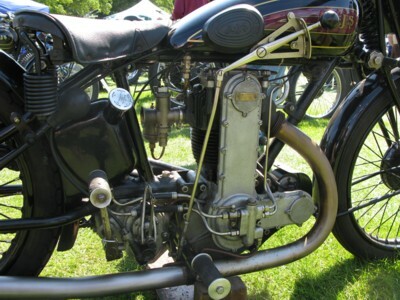 With a 1100cc Ruby engine it is quite a potent machine. 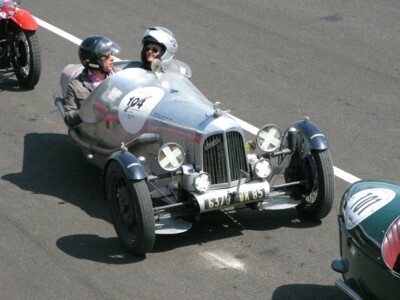 In its day, more rapid and refined than a Morgan but doesn't hold up against the power to weight of a developed racing Morgan. Strange 'Ganardiz' rotary engined beast. 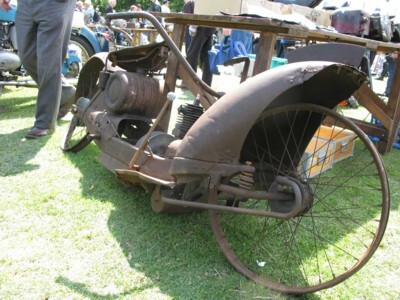 I know nothing about this wonky French one off rotary aero engined machine other than it says 'Ganardiz' on the tank, has a Sturmery gearbox, looks a bit ungainly and runs. It was started up by the owners but not ridden, the exhaust note was suprisingly subdued given the stub exhausts. 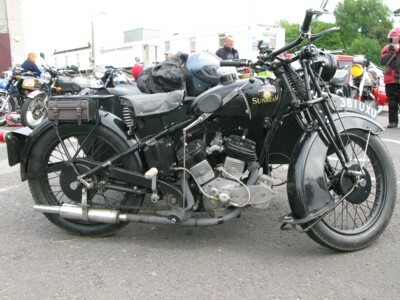 That carb has its work cut out though supplying five cylinders! 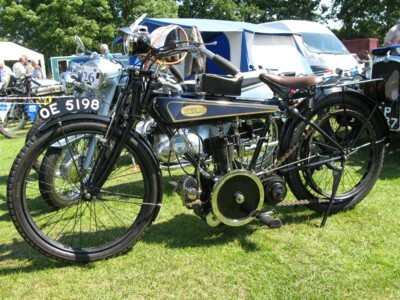 Look like a Morgan but isn't. French built, Blackburn engined, Darmont. Nougier Magnat Debon 125cc record breaker. 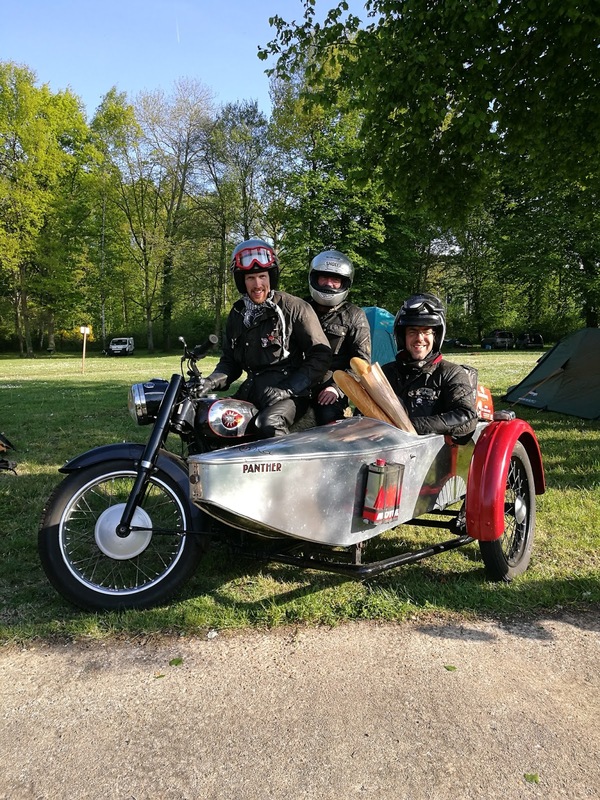 Nougier Magnet Debon record breaker. 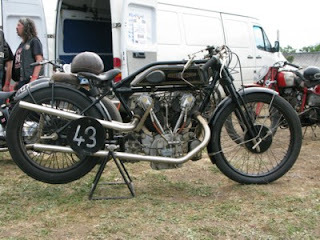 A genuine Montlhery bike, back in 1938 this machine took four speed records. 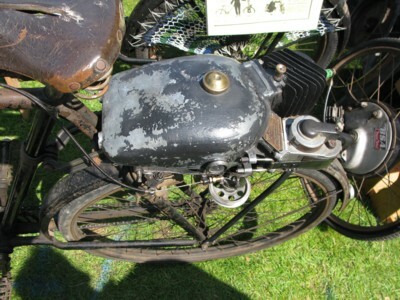 125cc, double overhead cam and four speed box. It took the 100 kilometers record at 114.450 km/h as well as the one hour, fifty kilometers and fifty miles records. '61 Norton Dominator 99ss homeward bound.